The pianist Walter Lang founded in 1999 the Walter Lang Trio. The trio released succesful Cd’s such as „Walter Lang Trio plays Charles Chaplin“ (1999), „Across The Universe“ (2002), „Softly as in a morning Sunrise“ (2005) „The Sound Of A Rainbow“(2005), that received the „Best Sounding CD Award“ by the japanese „Swing Journal“, as well as the CD „Romantische Straße“(2007) that got the Gold Disc Award by „Swing Journal“. 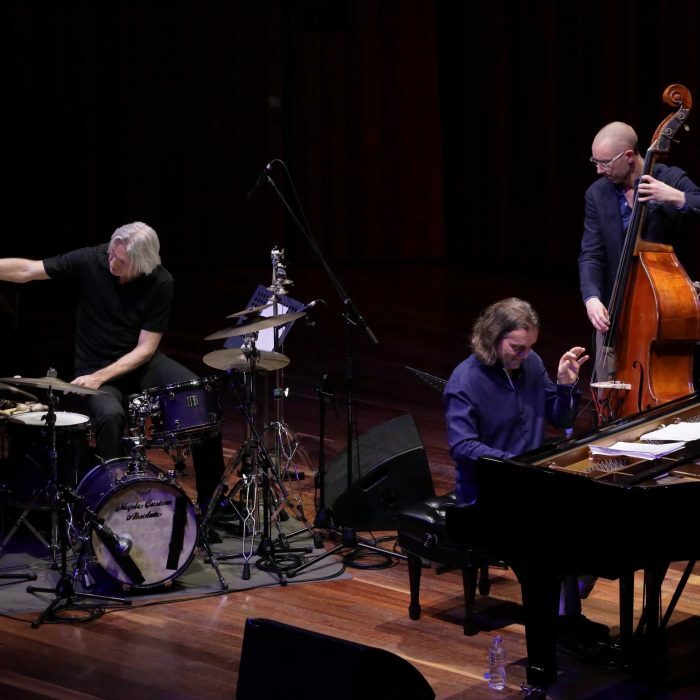 The trio has been touring all over the world, and is especially loved by the japanese jazz fans. In 2008 the Walter Lang Trio regrouped: Thomas Markusson from Gothenburg/Sweden is playing bass now and Sebastian Merk from Berlin/Germany is the new drummer. Their first CD „Eurasia“ came out in 2009. Toghether with Lee Konitz, the Walter Lang Trio recorded their first CD for JAWO Records „Someone to watch over me“, in 2011. Their latest CD’s „Translucent Red“ „Full Circle“, „Starlight Reflections“ and „Moonlight Echoes“ were released in 2018, 2016, 2015 and 2013 by the japanese label Atelier Sawano. was born 1961 in Germany. He studied piano and composition at Berklee School of Music in Boston and continued his studies at the Amsterdam School of the Arts. Along with drummer Gerwin Eisenhauer and bassist Sven Faller he founded TRIO ELF in 2005. They recorded 6 very succesful albums for the prestigous jazz Label Enja Records. His recent groups are, besides Trio ELF and the Walter Lang Trio, his world music project „World Percussion Ensemble“ and his duo „PWL“ with the the charismatic jazz singer Philipp Weiss. In February 2016 he recorded his first CD with the Shinya Fukumori Trio for ECM. Walter Lang has also played with Lee Konitz, James Moody, Chico Freeman, Don Menza, Roy Hargrove, Paula Morelenbaum, Dusko Goykovich, Lisa Wahlandt, Jenny Evans and many others. Born 1978 in Sandviken, Sweden. He started playing the doublebass at the age of 10. In 1997 he began his studies wih Anders Jormin at the College of Music in Gothenburg. For the last ten years he has worked and toured with a lot of Swedish and foreign musicians such as Rigmor Gustafsson, Nils Landgren, Jonas Knutsson, Chris Cheek, Phil Wilson, Asgèir Jon Asgéirson and Anders Persson to name a few. Over the years he has performed on a number of records with different jazz groups. He has also written music for the Swedish radio. Öström was the son of an artist couple, and was influenced by the musical tastes of his older brother like Jimi Hendrix, Deep Purple, The Allman Brothers and Lynyrd Skynyrd. At the age of eight years he built his first drum set and soon played music with a friend, Esbjörn Svensson. Since 1981, he attended the musical grammar school in Västerås and played with Svensson trio. Between 1983 and 1985 he studied at the adult education center in Sjövik before he continued his studies at the Music Academy Stockholm. During this time he played with various bands of the Stockholm scene; between 1987 and 1992 he was a member of the band of singer Monica Borrfors. Since 1989, he was back with Svensson, initially in the group Stock Street B , then again in a trio with the bassist Dan Berglund with an album released in 1993. e.s.t. released twelve albums toured internationally with great success. They played until the accidental death of Svensson.